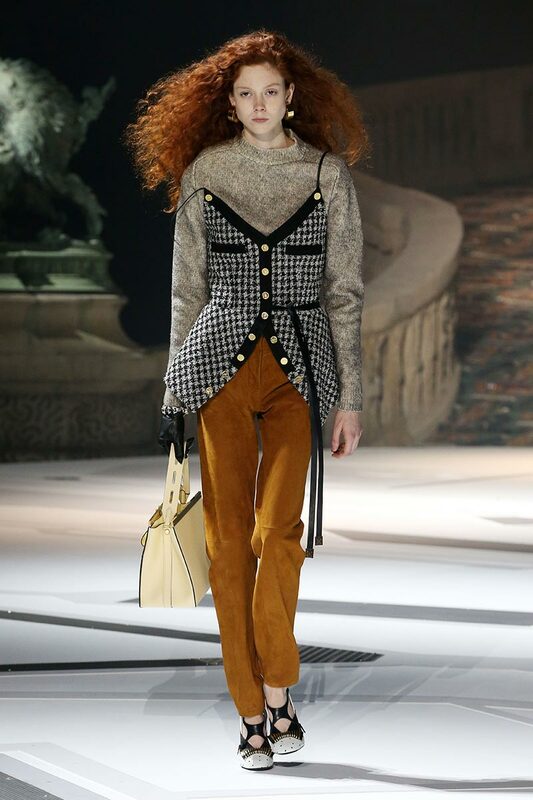 Nicolas Ghesquière dared last season to bring the alliance of the eighteenth century and the twenty-first century together in a spring summer collection that gave pride of place to his reinterpretation of historical costumes. For the fall-winter collection 2018-19 he persists but refines his intention: the border between the past and the present has disappeared. The strength of a new language remains for a woman with very French elegance, ready to change the world in a pleated skirt. - Isabelle Cerboneschi, Paris. "A woman does not need to dress as a man to change the world." 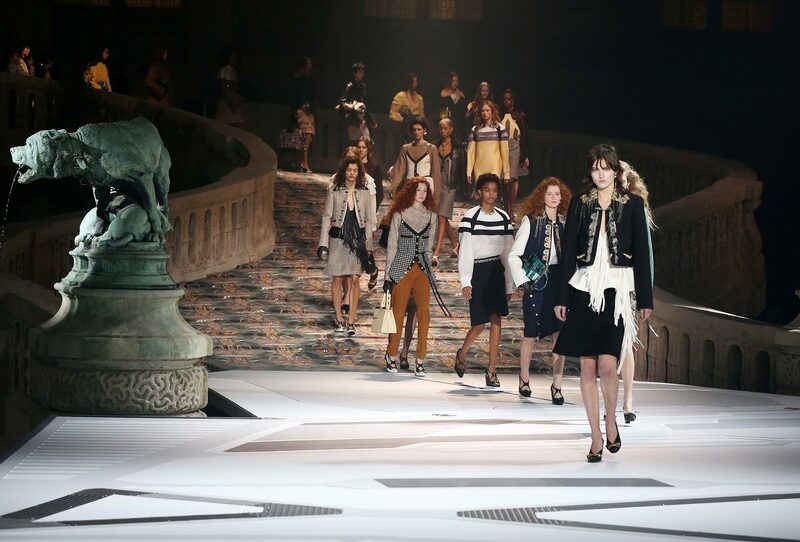 It is a place forbidden to visitors the Louvre Museum, the Court of Stables - known today as the Cour Lefuel - that Louis Vuitton chose as a backdrop for his 2018-19 fall winter parade. And as a podium: the double horseshoe ramp once used by the horses who went to the riding school, located on the first floor of the Louvre. Majestic! Covered with a carpet evoking the century of lights, the staircases, decorated with animal sculptures by Pierre-Louis Rouillard, end with a kind of launching space ship. A beautiful way to merge eras and styles. 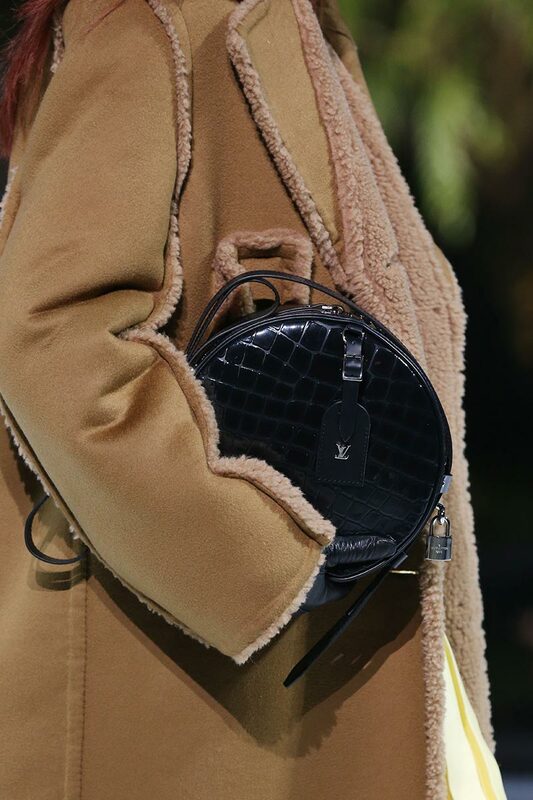 "A quintessentially French collection" is how Nicolas Ghesquière describes the fall winter collection 2018-19 he designed for Louis Vuitton, after the parade. He wondered about French elegance. And for that he has drawn both his own story - inspired by the looks of the women of his family - and in the history of the costume, dating back slowly since the eighteenth century, to arrive at a proposal which may concern the woman of today. He gives back to the dress, to the knee-high skirt, a place that she had lost and that one could find only in the films of Claude Sautet. He mixes them with eighteenth-century vests, as he did with the spring-summer collection. "But unlike the spring summer collection, which was very impregnated with the eighteenth century, Nicolas succeeded with a lot of lightness to merge the eras. 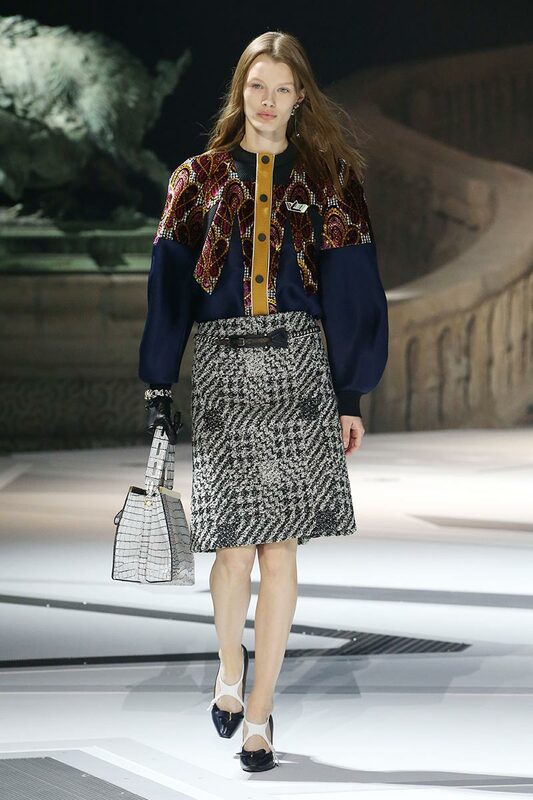 We do not see where the eighteenth century ends and where the twenty-first century begins, confided Michael Burke, Louis Vuitton's Chief Executive Officer after the parade. The metaphor of this collection, is entirely in these stairs that become a spaceship. It's impossible not to talk behind the scenes about the anti-harassment campaign #MeToo. As a silent response to this campaign, the Louis Vuitton House has distanced itself from photographers Bruce Weber and Patrick Demarchelier accused of harassment (and for the time being presumed innocent, because not yet tried). Also chosen was the actress Emma Stone, who very involved in this crusade, as ambassador of the brand. 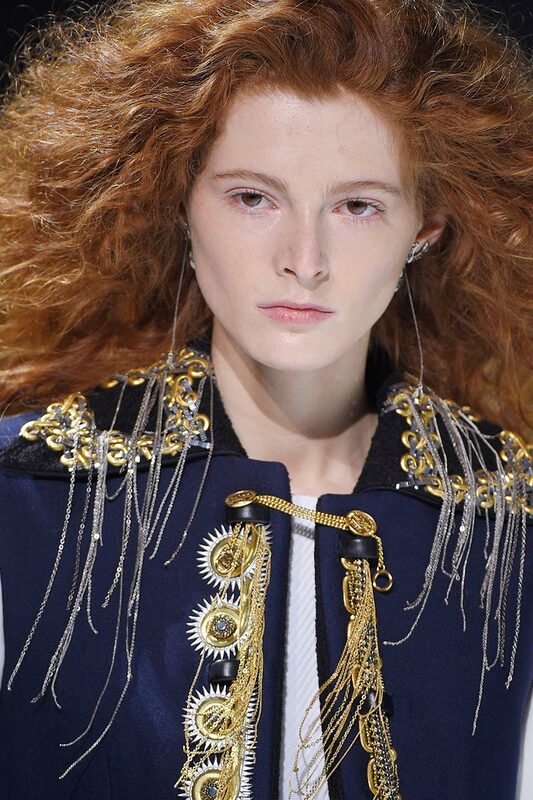 "This is a topic of conversation that we have every day with the studio, says Nicolas Ghesquière after the show. When working in fashion, one must be very aware of what is happening. Everyone, not just Louis Vuitton, is concerned with this topic and trying to do our best. " IC: What women have inspired you for this collection? 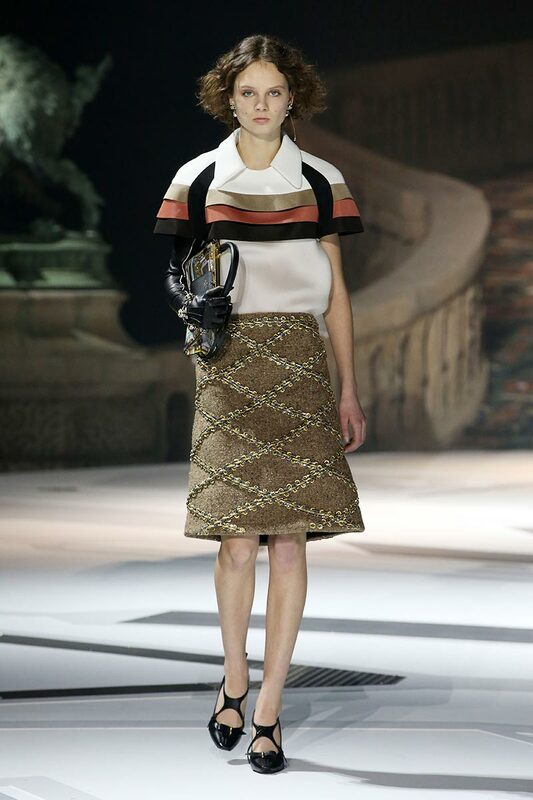 Nicolas Ghesquière: It was the women in my family with whom I grew up with who helped me build my aesthetic. And the close friends who still surround me today, too. They inspire me. They teach me who I am. 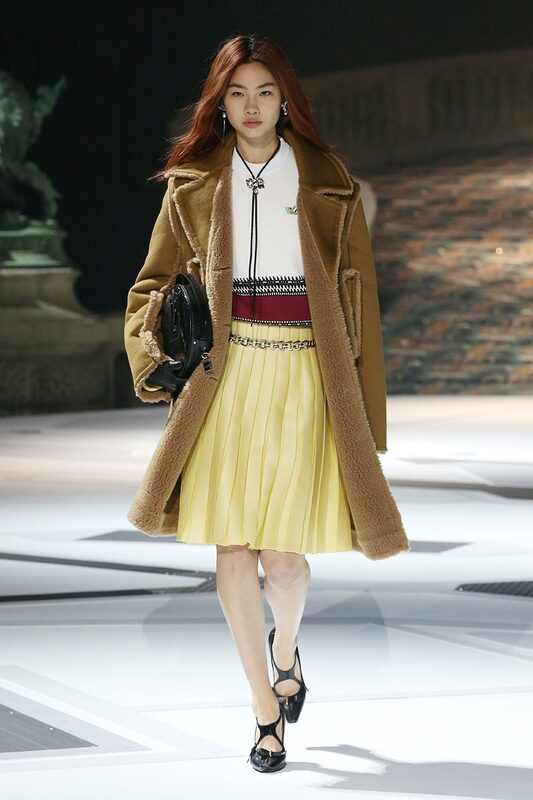 Like last season, this 2018-19 autumn-winter collection mixes eras, but differently. How did you proceed? This collection is a search, as if I had entered a time machine. We have more and more information about what our future might be, or what we believe it will be. At the same time, we are increasingly aware of the richness of our past and the experiences we can draw from it. And it is this bridge between eras that fascinates me and helps me to define the present: to take elements of the past, to understand what they meant in their context, and to reinterpret them. There is a certain rigour in this collection, compared to what I did in the past, but in a positive sense. She is quintessentially French. This woman whose wardobe you designed seems to be invested with a particular strength. What is she facing? She is confronted both with her nostalgia and at the same time with what awaits her. She has to face her future, and she is ready to make choices. For a long time it was thought that in order to give women power, they had to wear men's clothes. But it's a cliché. This is to forget that very strong women have worn very feminine clothes. I wanted to explore this idea: a woman does not need to dress as a man, nor for men, to change the world. And that's clearly what I wanted to show with this parade.